The ultimate “guilt-free” frozen ice cream treat made with only ONE ingredient, over-ripe bananas! No cream, or sugar added. Finally it’s OK have ice cream for breakfast. For a more decadent pleasure, this guiltless frozen banana ice cream would go great in Mexican “Unfried” Ice Cream or even paired with my Strawberry Crisp or Grilled Peaches. On my recent trip to the Dole Banana Summit, I was introduced to my first Yonanas Ice Cream Treat Maker – coolest machine EVER! 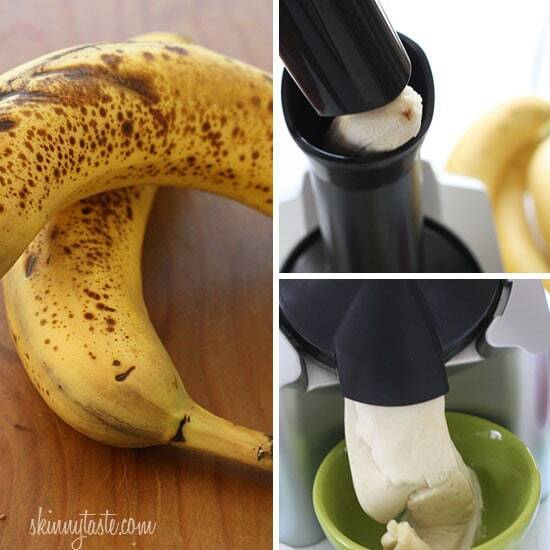 You basically take your over-ripe bananas, freeze them, then run them through this simple machine. Out comes a healthy frozen, soft-serve banana ice cream. So easy, and fun to make with the family. Ever since I got my Yonanas, we’ve been experimenting with all the possibilities but quite honestly my favorite is some chopped walnuts and berries. I put some colored sprinkles on my toddler’s and she loves it. You can also add other frozen fruit such as berries, pineapple, mango or if you want something a little more decadent you can add some dark chocolate, or peanut butter. Think of the possibilities! Now, if you don’t own a Yonanas, you can still make this frozen treat in a food processor , simply freeze the bananas and process until smooth and creamy. The ultimate guilt-free snack, breakfast or dessert! Peel bananas and place in the freezer until frozen. When the bananas are frozen, place them through the Yonanas Ice Cream Treat Maker and enjoy alone, or with your favorite topping. If using a food processor, follow the same steps, and process until smooth. You need really ripe bananas… Not mushy ripe but where the deal is practically brown or covered in brown spots. The bananas have to be really sweet. Love this! I added some cocoa powder to mine. Tasted like chocolate covered bananas! I didn’t let my banana slices thaw at all, it took a little while for it to process, and at first sounded like I was trying to chop rocks, but it finally started to get creamy… Just like soft ice cream. So good! I don’t know if it’s the Yonana maker but it doesn’t taste good! I used freshly frozen bananas!! I know this is an old post but I just did a chat with Weight Watchers and asked how many points for ice cream made with only 1 banana and I was told 5 Smart Points – you are showing 0 points. I’m not sure now. If putting fruit in a blender changes it to where we have to count points, wouldn’t that apply to blending bananas to make ice cream? It does not make sense to me that blending fruit makes them no longer 0 points but that is what WW keeps saying. Definitely guiltless ice cream and healthy one! I like the ice cream maker too! Been used it for a while. :Unfortunaltely the guiltless banana ice cream put in the WW recipe builder is actually 5 points per one banana. According to the WW leader when you enter it in the recipe builder you have to click on blend first to get the true smart points. It seems that once it’s blended it is no longer 0 points because it no longer takes as long for you to digest it hence the 5 ww points. Wish it were the other way. Just an FYI. Actually, it sends to use the blend button ONLY for drinks. Since you eat this with a spoon, I don’t think that applies. Hi there…how are you getting this at 0 points? The recipe builder puts a blended banana at 5 points…whomp…whomp. I'd appreciate your thoughts. According to the Weight Watchers website recipe builder, a blended banana is 5 points. I have tried this before and it's great! Just like ice cream…only healthier. Once I make the banana ice cream, can I refreeze it and what will the consistency be like once refrozen? 🙂 Thank you! What about adding vanilla protein powder? Do you think that would be good? Thank you, Gina! I decided I wanted chocolate banana icecream, so I added cocoa, raw sugar and a splash of milk. It turned out delicious :). I also think this would be the perfect basis for a guilt free milkshake. I made a batch with bananas, blueberries and peaches. It was SOO delicious. I think the combo was in the book if the Canadian/American books are the same! Gina, after reading this blog in November I kept trying to find an excuse to buy one of these Yonanas! Finally, yesterday was my 45th birthday, so I got one…so excited, I opened it up and used it immediately. Fabulous…better than expected taste and texture of banana blueberries and mango. My kids loved it and asked for some more this morning when we woke up! P.S. I got mine pretty cheap on Ebay…tons of them on there. Thanks again for sharing this idea – life just got healthier in this house! Is there any way this would turn out similarly if done by hand? As a college student on a budget, I do not have a food processor/blender/yonanas machine! I'm a little confused about the points on this. I though bananas were 2 ww pts. So how is this 0 pts? Help! Points Plus points with WW = fruit is 0. Obviously you don't want to gorge on fruit all day, but with the new WW point system we don't count most fruits or veggies. Will this freeze well like ice cream or does it turn into a solid block?? This is pure genius! The texture was JUST like soft serve ice cream, I couldn't believe it! I cut up frozen bananas into 1/2" chunks and processed in my mini Cuisinart food processor – one and a half banana at a time. GREAT results, total hit with my 3-year-old and my 1-year-old! Can't wait to try adding berries into the mix instead of just on top. With just the bananas, this wouldn't work in my ninja food processor. However, I added a tiny bit of milk, and then it worked. It was delicious! I just made this and it was delicious! I've lost 6 lbs this month, and you make it so easy to stay on track! This was delicious, thanks so much. I am confused on the WW points, you have it listed as 0 points but when I input the stats into my calculator, it states 3 points. Does anyone know how that is supposed to be recorded? Are you using the Flex point scale? If so, fruit would be 0 points and this treat would be zero points (not counting the toppings), am I right? I just started the WW Points Plus program and one big thing I learned at my first meeting was that whole, fresh fruits are zero points, but fruits in a smoothie or something cost points because they are blended, and so your body is not getting any of the fiber or doing any of the work to break it down – you’re basically just sending sugar to your bloodstream. I was super disappointed, because I LOVE banana ice cream, but I assume this works on the same principle. I am going to ask specifically about this at my next meeting, because mashed bananas for banana bread are still zero points in the recipes I looked at on the WW site. The Yonana machine is fantastic and should be in our schools given the focus on improving nutrional offerings. Not sure if they make one but we love our machne we use at home. Thanks for the great recipe. This is perfect I was looking for an ice-cream recipe without the calories – I was nearly going to revert to a suggestion my friend made about just freezing grapes and have ice – lollies type dessert …. 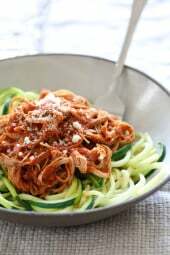 I tried this yesterday (just using a food processor) and it was wonderful!! Peruvian Lucuma Ice Cream. I would love to try using frozen lucuma. This is the coolest invention! I love the frozen banana with avocado ice cream version; however, my family has an aversion to eating green banana ice cream. I have been wanting to try this for a long time – looks so good! I love this trick, I do it in the food processor all the time! We had so many bananas this week that I was excited to try this. I made it last night, and added some frozen raspberries for a few of the last pulses in my food processor. It was AMAZING. Both my kids (6 and almot 4) gobbled up 2 helpings. I'm going to use this, with different flavour combinations, to make an "ice cream cake"!! Normally I don’t like to eat banana but this looks very colourful. 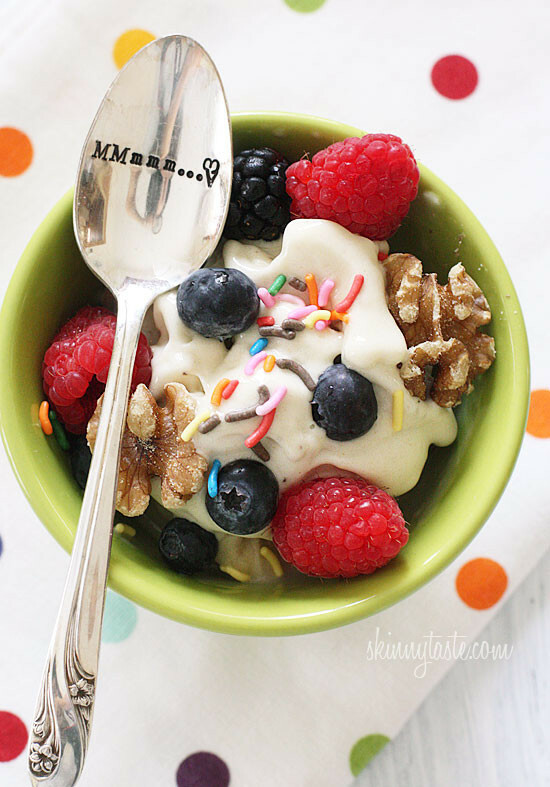 Sad I wasn't able to post for a chance to win the Yonanas maker… but I would love to try this recipe. It looks so good. I attempted to make something like this after someone on the WW website told me about it from another blog but it didn't work so well in my blender! I would do a Chunky Monkey… bananas, PB2, and a Fiber One Brownie! Can you save this ice cream for a few days? Maybe with some lemon juice? I have a yonanas and LOVE LOVE LOVE it!!! I blend the bananas in the machine with frozen berries too. Changes it up a little. Great recipe! 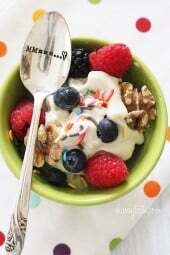 I usually do this one with bananas, strawberries (to add more vitamin C) and a bit of plain yogurt. So yummy! and i use my vitamix which works perfectly! OMG! I just ordered mine from Amazon. I didn't even get to the giveaway part. Oh well. It will be here tomorrow. Can't wait to try it! I would love to own a Yanana machine. I have lots of bananas in my freezer. I own this. I tell my grand kids it is. My "special" ice cream. They love it. I will have to try the peanut butter. Oh M Gee!! I love banana ice cream but it takes forever to make with my blender or food processor. I would be over the moon if I won this. I like to put peanut butter in my banana ice cream and I bet nutella would be so delicious in it too. Dark Chocolate shavings with bananas….YUM! Sears has the Yonana on sale for 29.99! Just saw it at Target yesterday! WHERE DID YOU GET ALL THESE ENGRAVED SPOONS?! Please do tell. For SUch A Time Designs on Etsy, the link is above. This looks amazing! And such a healthier alternative to my nightly ice cream binge! Thanks for a tasty recipe! I would make banana and walnut ice cream – like a frozen banana nut bread. I LOVE my Yonanas. It is a great invention. I make banana with cherries and add some mini chocolate chips. Oh my, so good! I didn't think of putting peanut butter. I will try that next! I am definitely going to try this…. and that jar of Nutella on my countertop looks like a natural add-in! You can make this in your mix master if you do not have the Yonanas Ice Cream Treat Maker. I would add cocoa powder and a little milk, makes great soft serve chocolate!! I do this in my Champion Juicer and they're yummy! So wish this was possible in "banana-free" versions!! Whilst I normally love a fresh fruit berry sorbet..they can veer quickly into "ice block" mode if stored in the freezer for very long.. I unfortunately..a)Am not a banana fan (taste) and b)..they are HIGHLY glycemic..and not the best choice for those with insulin spiking..metabolic issues…Any thoughts/suggestions?.. Add strawberries or other fruit to lower GI. Or add other low GI foods. Thanks. Strawberries we love and I think it would be awesome ice cream! What an awesome idea! Wish I saw this 2 days ago before I threw out my old bananas! Hi Gina! I love your blog! I have cooked so many of your recipes since finding it! 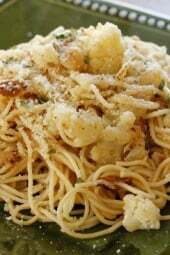 This is a great recipe, I've been making this for years in my food processor. I actually used the "banana ice cream" in your banana cream pie recipe: instead of placing slices of banana on the pie crust, I mixed about a cup of softened banana ice cream with the other ingredients. The results were amazing! What a fun giveaway! I'd love to win one to give it a try! Frozen bananas do taste really good. For those who want something warm, try this: Peel a banana, slice it in half lengthwise, put it on a plate and warm it for 20 seconds in the microwave with the slightest bite of shredded cheddar cheese. Eat with a fork. Yum! I would make a Strawberry Banana ice cream dessert in a cookie crumb tart. We eat ice cream everyday and don't own an ice cream maker, a luxury I can't afford. I hope I win! I do this often–slice a banana and freeze it, then throw it in the food processor with a handful of frozen strawberries and puree. DELICIOUS. I, also, had trouble leaving a post on Skinny Bits — not sure if it's on my end or yours. But, I'd made something Hawaiian themed with coconut and pineapple and mango! Yum! This is funny to me…This morning, I was searching all over the internet for banana recipes. And I said to my husband, "why is it that the only thing people can come up with is banana muffins? There's got to be more than banana muffins." Then I thought to myself, I bet Gina at skinnytaste will have something for me. 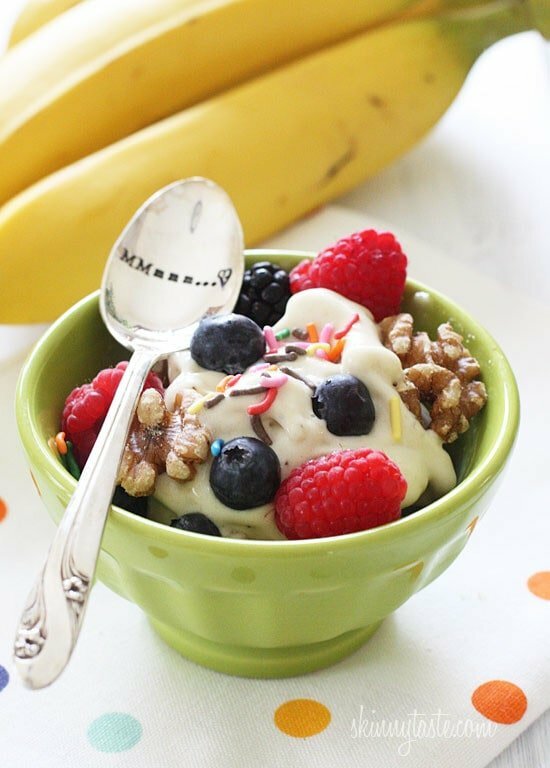 And what's on the homepage…banana ice cream! Get out of my head Gina! And thank you!!!! Is it just me or does anyone else find that overripe bananas have a yucky aftertaste to them? I'd like to make a banana raspberry concoction. I used to get this smoothie combination at the mall when I'd go, and it was delicious! We make this all the time but yours look amazing! I always feel like I am indulging. I love it with peanut butter – so good! I really need to get a yonanas machine! yum! we always have ripe bananas. My kids would love raspberries with sprinkles on top of course. Would a fun healthy alternative! OMG it looks really nice!! A word of caution: Use ripe but not over ripe bananas for this. I save up bananas in the freezer all year to make banana breads for gifts at Christmas. We used some of these "banana bread" bananas (I let mine get REALLY ripe before I peal them and but them in the freezer in ziplock bags of three)and it was vile. They blended fine and the texture was good, but the bananas were too ripe for this and it ended up tasting like we had poured brandy in it. We are going to try it again with ripe but not over ripe bananas as bananas that are perfect for great bread are not great for this! I am sure the problem is on my end, but I couldn't leave a comment on skinnybits. Can you include me in the giveaway? I would add walnuts and strawberries. I think it might be good with cocoa powder or pb2 if you can get them to dissolve. Do you freeze them with the skin on? Love this idea. It's good if you like bananas. If you don't, you probably wouldn't like it. I know you mentioned a food processor earlier but what about using a Magic Bullet? Would that work? I'm thinking that a frozen banana plus a little chocolate and peanut butter sounds amazing. I don't know, I never tried but I think it needs a powerful blade to get that ice cream result. A Blendtec or good blender would work. This is 3 years late, but how did it go? I also have a magic bullet, and I made some yesterday. It took a while, but the bananas eventually blended. I had to be careful not to overwork the motor; if you keep it running for more than 1 minute it starts to deteriorate! I'd like to know how it went for you! Banana ice cream is a lot cheaper, too! Nothing's cheaper than bananas! I had one and I returned it — do you always have to use bananas as the base food? Then just add other stuff to it? I didn't think it yeilded a whole lot for a lot of work. Thoughts? You can make fruit sorbet with frozen fruit, but the bananas give you the creamy ice cream texture. 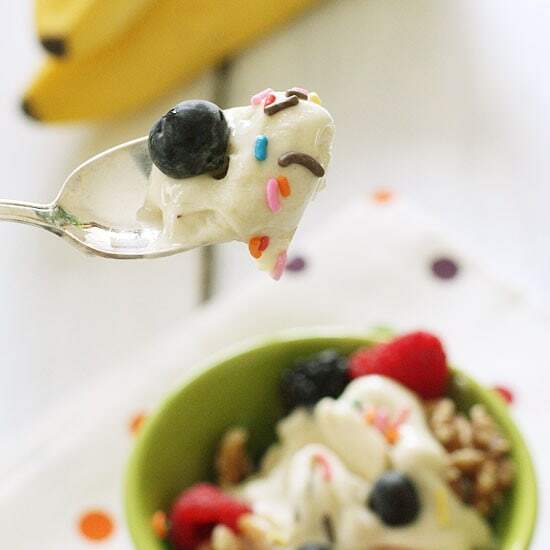 You can use bananas plus other stuff to achieve different flavors. I think it's good when you want to make more than one serving. Where did you get that spoon??? LOVE IT! Yummy making for after school snack!! This looks so good. I'm trying to stay away from sweets … this would give sweet w/o points! Not a food-related question, but where did you get the spoon in the first picture? Thinking it would make a great gift for someone! The link to the spoon is from Etsy, look in the second paragraph. 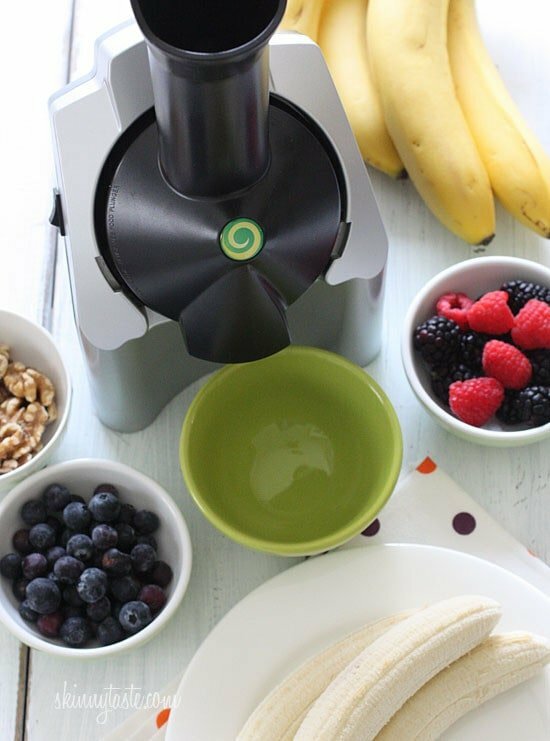 I LOVE my yonanas machine…have only had it in about 2 weeks..and have made blueberries, strawberries, mango, and the other day…PINEAPPLE…which was awesome! Love this more than ice cream! I LOVE my yonanas machine! I usually do frozen strawberries with bananas and some semi-sweet chocolate chips. So yummy! I could definitely use some new ideas, though, and will have to try the walnuts! I must be doing something wrong, because my son's yonana machine never results in a creamy, melty banana treat. It is way too thick, and seems to leave an after taste. Any suggestions? The bananas have to be super ripe, ugly and brown for best results. If the bananas are too frozen, you may need to let them that a few minutes. Mine has a strange after taste also! Totally works with a food processor! I do it all the time! Me too! I slice the banana 1/2" thick before freezing to make it easier to purée. How does this work with a food processor ? Yup, I did that prior to owning a Yonanas. can I put the bananas in the food processor first with what ever ingredients and then freeze? 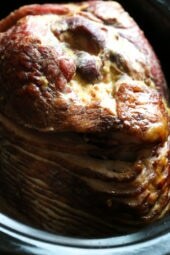 or freeze first then food processor with additional ingredients? Is there anyway to get this end product without the yonana machine?? like a food processor maybe? I have been making this for a year, and there is an easier way. Just puree your overly ripe bananas in the food processor, and then put in a freezer safe bowl, and stick in the fridge. Take the bowl out every half an hour to stir it up, and ensure even freezing of the banana puree. This is an easier way to make the bananas, and then you can control the consistency a bit better. I like mine to be more like a soft serve ice cream anyway, and a couple hours in the fridge with two bananas usually does the trick. I use the magic bullet blender, which is perfect for a single serving. This is one of my favorite treats – I love adding PB2 or regular peanut butter in the mix! Oh, what will I not make with the Yonanas Ice Cream Treat Maker? My first concoction will be peanut butter banana with a touch of coriander. Yum, I can't wait! Please leave your comment on Skinny Bits, see link above. I would love, love, love to try this!